HUGH HEWITT: Morning glory, America. It is Friday, August the 3rd, 2018. And we are in the middle of a fight for the future of the Supreme Court. And I have been using this hour, the last radio hour of the week, the Hillsdale Dialogue, as it is known, for the past few weeks, to talk with professors at Hillsdale-- Professors Carrington and Moreno about the future of the Supreme Court. And we're continuing on in that series today with the help of Ronald Pestritto. Dean Pestritto is the big boss of the graduate school up at Claremont. He is a professor of politics-- the Charles and Lucia Shipley Chair in American Constitution, and an administrative law expert. And we're going to make you understand what that-- you will be made to understand administrative law, because this is the first time I've ever actually talked to anyone other than myself who has taught administrative law on the show. So Dean, welcome. It's good to have you. RONALD PESTRITTO: Good morning. You know, you're risking your audience by bringing up the topic of administrative law so early in the morning. HUGH HEWITT: I know. They need to know, though. RONALD PESTRITTO: But I'm all for it. HUGH HEWITT: They need to know. And the administrative state-- this is the perfect setup. The administrative state struck back at Brett Kavanaugh yesterday. I want to read you a WashingtonPostpiece by my friend, Sung Min Kim. "The National Archives said Thursday"-- note that we attribute to an agency the ability to speak-- "the National Archivessaid Thursday it will not be able to produce the full cache of documents requested by the Senate and Supreme Court nominee Brett Kavanaugh until the end of October. But Republicans indicated they would press ahead with plans to hold the confirmation hearings next week. Gary Stern, the archive general counsel, told Senate Judiciary Committee Chairman Charles Grassley, in a letter, that the records Grassley has requested could total more than 900,000 pages. And please note that we will not be able to complete our review of all the records that you have requested by August 15th." What do you make of that, by the way? And there are 3,000 employees of the National Archives, by the way. RONALD PESTRITTO: Well, I think, unfortunately, the confirmation process is really much more political than it is about serious review of judicial qualifications. And then, as you know, that goes all the way back to the Bork hearings, where Judge Bork made the mistake of actually being forthright in the way that he answered questions. And given the environment right now, I really think that one side is interested in simply holding up the nomination by any means that are available to them. And I think they need to do that for the sake of their base, and their fundraising, and the midterm elections and all of that. I don't actually make much of it. I think the Republicans will press ahead. I think that Kavanaugh will be confirmed. And I think this is a lot of noise, to be honest. HUGH HEWITT: Now, a lot of people are coming out of their chairs, or swerving their cars on the road to say one word, Garland, or maybe two words-- Merrick Garland. And they are apoplectic that you and I are saying the Republicans are just going to blow off the archives, they're going to blow off the rules. They're just going to move forward because they have the majority. But Dean Pestritto, that's what the Constitution says. RONALD PESTRITTO: It is what the Constitution says. The answer to that is that the other party should win some more Senate elections. The consent of the Senate is required in the appointment of Supreme Court judges. And if the Democrats were in control of the Senate back when Judge Garland were nominated, he'd be on the Supreme Court right now. But they were not. And this is a republic. And elections matter. And that's how it goes. HUGH HEWITT: And if they get control of the Senate in January, because of the elections which will be held in November, that will be the end of Republican judicial nominees. They're just going to shut it down. And I have no doubt in my mind. And by the way, that would be legitimate. It would be a political issue in the year 2020, but the Senate is given that power. I'm going to come to the administrative state in a moment. But I know you know your constitution. I like to emphasize this to people. It's not a difficult document. It was intended to be read by farmers. It was intended to be read by yeomen. They knew what they were voting for, and they were voting for a Senate that would get to choose who the judges were. RONALD PESTRITTO: Well, I've said for years, when you had Democratic nominees, that I wondered why Republican senators had been so compliant, when it was obvious that the nominees had very radical judicial philosophies. And it seems to me the Democrats have taken much greater advantage of, quite frankly, of the Constitution and of the Senate's role in consenting to judicial appointments than the Republicans have. And so I think the Senate was given an essential function here. And they're simply exercising their constitutional duty. HUGH HEWITT: Now, there are flashpoints in the proceedings surrounding every Supreme Court nominee, which typically go to the social issues of the day-- previously, gay marriage, currently, reproductive rights and abortion. But you and I both know that the hidden hand here is about the administrative state, what it is, and who's going to run it. So I want to step back for a moment. Since this is your wheelhouse-- you've written American Progressivism. You have written Woodrow Wilson and the Roots of Modern Liberalism. You've written about the legacy of the founding and challenges to the founding. Would you just take a moment and explain to people what the administrative state is, and why it is not a “deep state,” it is an administrative state? RONALD PESTRITTO: Sure. You know, I think most simply, the term refers to the fact that so much of the policy that is made today, the vast majority of the big policies that we talk about, are often not really enacted by the people's elected representatives in the legislature. These policies are made by unelected, life-tenured bureaucrats who serve in administrative agencies. And if you think about some of the major policies we've debated of late-- the various regulations regarding Obamacare-- many of the specific policies don't pertain to the law itself. They come out of the Health and Human Services regulations that are made. Or the environmental debates that we have about greenhouse gas-- we haven't passed a major environmental law since the 1970s when we had the Clean Air Act, although it was amended in the early '90s. The policies you're talking about are made by regulations. And so even though we have this republic, and we have our Constitution, as you mentioned, that tells us Congress makes the law, and that's how this works, those members of Congress are accountable to voters. And by and large, most of the policy that's made is not directly accountable to voters because the agencies make it. And that, I think, is the basic fact that I think more and more people are aware of these days, but still, there's not enough light shined on it. The Congress doesn't really legislate very much, and so elections matter less and less. And that's what I think leads people into this kind of conspiracy talk about deep state. You know, they think there's some kind of unaccountable entity out there. And it's true that there is, but it just comes from this basic fact that Congress has delegated a lot of its lawmaking power to the administrative agencies. HUGH HEWITT: And it's also simply a question of size. There are 2,711,000 employees of the federal government. And I want that to sink in. 2,711,000 people work for Uncle Sam. They are not teachers. They are not policemen. They are not firemen, though there are among those 2,711,000 people, some who are teachers, for example, in the Indian Service Bureau that takes care of schools on reservations. There are some who are firefighters, who are at this very moment risking their lives. But generally, those 2,711,000 people are not the people that you and I associate with government, right, Dean? RONALD PESTRITTO: No. Most of the types that we associate with government are the government officials we would normally come into contact with in our ordinary life. Those are mostly state and, most often, local officials. RONALD PESTRITTO: You're talking federal employees here. HUGH HEWITT: Yep. And there are 600,000 of them are in the postal service. So we know where 600,000 of the 2.7 million are. But it's those other 2.1 million people who are doing things that you and I have to deal with every day. And we really aren't aware of where they live and what they do and under what authority they do it, but they do impact us, I think, probably on a daily basis. RONALD PESTRITTO: Very significantly. And this is-- to pick up on my previous point-- you mentioned the size, of course, of this group of federal employees. In a way, that was necessitated, historically, by the New Deal and the various expansions of the role of the federal government in the 20th, and now into the 21st century. As the government gets itself into more slices of American life, Congress can't make enough rules to manage all that on its own. Not even close. And so all of these agencies are created, coming out of the '30s and going forward, as a way of implementing the policies of the New Deal, the policies of the Great Society. And so in a way, we have kind of necessitated the punting of a lot of legislative authority to these agencies. And that's where this area of administrative law, that I know you know very well-- but that's where this area of administrative law comes in. How are those agencies supervised? How are they governed in the way that they behave? HUGH HEWITT: And the Supreme Court sits atop them in ways that are important and enduring. And we'll talk about Brett Kavanaugh's role in the reining in of these agencies when I come back with Dean Pestritto. From Hillsdale College, all things Hillsdale are located at hillsdale.edu, including courses by Dean Pestritto on the administrative state. Go over there, sign up, all of my previous conversations at hughforhillsdale.com. Stay tuned. Welcome back, America. That music means it's the Hillsdale Dialogues. The last radio hour of the week is when we go high. The rest of the news business goes low. We go high at the Hillsdale Dialogue. I'm Hugh Hewitt in the relieffactor.com studio, West Coast. I'm joined from Michigan by Dean Ronald Pestritto. He is the Dean of the Politics, Van Andel Graduate School of Statesmanship, and the Professor of Politics, the Charles and Lucia Shipley Chair in American Constitution. He is an expert in administrative law. He's a lot more fun than Larry Arnn, but then again, everybody is. Dean, let's talk for a moment. Right before the break we were talking about the 2.7 million people. They range from GS1s, who make $18,785, up to Senior Executive Service employees, who make $179,000 a year. So no one is actually making billions, or millions, or even hundreds of thousands of dollars doing this, but they are busy doing their jobs, which is to control the lives of other Americans. Is that a fair thing to say? RONALD PESTRITTO: Well, I think you can get there, ultimately. You know, the thing I'd like to remind folks as we talk about the administrative state is, in a way, I think the blame lies more with the legislature, with Congress, than it does with these administrators, because these agencies are the creatures of Congress. Congress is the institution that has decided to create them, that has expanded the scope of the federal government, and has come to rely on these agencies, and often gives them impossible missions. So take, for example, take something like clean air legislation. You have an extremely vague law, like the Clean Air Act. And Congress wants to get credit for voting for clean air. And so they enact this law, which basically says, we hereby decree that there shall be clean air. And we're going to set up this agency. And we're going to leave these bureaucrats with the responsibility of making the tough decisions and regulations to make it happen. And so Congress has the advantage of punting to the agencies the difficult task of picking winners and losers, of making tough decisions. And so in a way, I point the finger not so much at the bureaucracies themselves-- which I don't like any more than you do-- but at Congress. The agencies are a creature of Congress. HUGH HEWITT: Exactly right. And when the Constitution was designed in 1787 and ratified in 1789, there was nothing in Washington. There was a river. Now there is the Department of Agriculture, Commerce, Defense, Education, Energy, Health and Human Services, Homeland Security, Housing and Urban Development, the Interior Department, Justice Department, Labor Department, State Department, Department of Transportation, Department of the Treasury, Department of Veteran Affairs. And I don't even want to go into the agencies, boards and various commissions and bureaus. It is vast, Dean. Vast. And this jungle of regulations that Congress has punted to, every day it flows out of Washington like an avalanche down on ordinary Americans. And when the republic began, no one dared think of telling you where to build your farm house or what river on which to stake your tent. RONALD PESTRITTO: And the Republicans, I think, have lately come to realize-- I think, far too late-- the significance of the facts that you are describing. Especially when, in the Obama administration, when the Republicans won back control of Congress, and it was clear that the President wasn't going to get his legislative agenda through, he turned to the agencies. And he turned to, essentially, making law without Congress. And what the Republicans came to realize, too late, is that, of course, the apparatus had been in place for decades, that very much allowed the executive to do that-- essentially, to legislate without congressional warrant. And so many of the controversial Obama era policies were done administratively. And that's why we've now turned to the courts to try to rein in the agencies. But the legal structure, has, for decades-- as you know, if you teach administrative law-- has really been one that's been very favorable to giving the agencies a very long leash. HUGH HEWITT: So long, in fact-- when we come back from break, RJ Pestritto, the Dean of the Graduate School at Hillsdale and I will look over something known as the ChevronDoctrine. It sounds like going to the gas station, but it's a lot worse than that. The ChevronDoctrine is, in fact, the manacle that links us all to this vast bureaucracy we're talking about. Dean Pestritto is my guest. From the graduate school at Hillsdale College, this is the Hillsdale Dialogue. All things Hillsdale collected at hillsdale.edu. All of these conversations at hughforhillsdale. Stay tuned. We'll be right back. 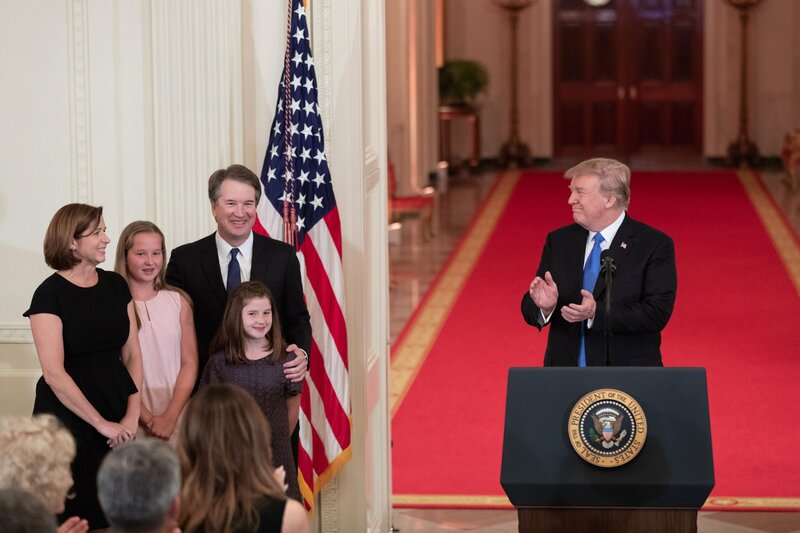 Brett Kavanaugh is front and center when we return. HUGH HEWITT: Welcome back Americans. Hugh Hewitt. That, of course, from Hamilton, talked about the room in which it happened. And when Hamilton, Jefferson and Madison got together to do the deal, they were not talking about administrative agencies. But I am, with Dean R.J. Pestritto from the graduate school at Hillsdale College. It is the Hillsdale Dialogue. Dean, when the framers got together, they really never intended for this vast federal bureaucracy to exist. And so the rules governing it came along later in something called the Administrative Procedures Act, which is an act of Congress, and then in the authorizing legislation for every one of these agencies. What did we lose sight of along the way? RONALD PESTRITTO: Well, I think you're right to start with the founders, of course, always. And you're certainly right about their lack of intention for the situation we have today. Although, of course, the Federalists were no shrinking violets about federal administrative power. They wanted a vigorous administration within constitutional boundaries. And so that's really the place to start. I mean, you talk about the agencies. And they're governed by Article 1 and Article 2 of the Constitution. Article 1 is the article that vests the legislative power. And the major question there is, is Congress still making the law? That's what we look at when we bring up Article 1 questions. Or is it the case that so much discretion has been given to the agencies that now the agency, the executive agency, is making the law instead of Congress? So that's one major area of legal question. The other major area is Article 2, which sets up the executive branch. And remember that Article 2 gives all the executive power to the President. And so you have these agencies, and they've got to be constitutionally somewhere, in some branch. And they're obviously in the executive branch. But the question becomes, how much control then does the President have over the agencies? Because remember, the President is the only one who's elected. And is there enough power, because Congress has wanted over the years for these agencies to be more and more independent of the President. And so it's another set of constitutional questions. Is there enough Presidential control? And Judge Kavanaugh has actually written a lot about that. But you're right to cite the Administrative Procedure Act. It was enacted in the 1940s. It was enacted to tighten controls on agency procedures. But this was greatly weakened by court interpretations, especially in the 1970s. HUGH HEWITT: And in the course of this long, extended growth of the federal government, there came to be known something as the Federal Register. And the Federal Register used to be a staple of the great one, Ronald Reagan's, every stump speech. He would talk about how long it was, and what it meant, and how every day, in every way, all of these agencies would put out notices of comment and rulemaking, in which they would propose to take actions. They would give the public 60 days to comment, sometimes 90. They would take in those comments. They would allegedly review them, and then they would put forward a rule which would then bind the people, under force of law-- for example, the Endangered Species Act, that they listed a species, and 60 days later, it was put on the act-- if you touch that species, you would go to jail for a year. Most Americans had no idea this was going on. And that's one example, Dean, of all of this vast apparatus. How in the world does Brett Kavanaugh's nomination bear upon this massive behemoth, the Leviathan, that we have created? RONALD PESTRITTO: Well, it's funny you mentioned the Federal Register. I always start my administrative law classes by just showing my classes some examples of the Federal Register. HUGH HEWITT: That's a good way to hold down the number of students. RONALD PESTRITTO: Exactly. You got that right. So I have my own self-interest there. You're very perceptive. But with regard to Kavanaugh, I would think the following thing is the most important point here. He's in the D.C. Circuit Court of Appeals. And the vast majority of administrative law cases in this country go through the D.C. Circuit. It's kind of like a mini Supreme Court for administrative kinds of cases, because all the agencies are there in D.C., or most of them. And so he has had opinions on a lot of critical cases dealing with administrative agencies. And the important point is that his reasoning on some very important cases, even when he himself may have been in the minority on the D.C. Circuit, his reasoning has later been adopted by the Supreme Court in a few big administrative law cases that it hears. And so I think he really is someone who can be influential. HUGH HEWITT: Well, when the D.C. Circuit got going, the original Federal Judiciary Act provided for circuit courts. And the D.C. Circuit is the smallest one. It only has 12 judges. I clerked on it. I clerked on it in the great era of Ginsburg, Scalia, Starr, Bork-- they were all on there-- Spotts Robinson-- they were all there. And I worked for Judge McKinnon, Judge Robb. And they would patrol the fences. That was their job, was to make sure that the agencies were doing their job. But along came this doctrine, the ChevronDoctrine. Would you explain to people what it is and how it cabins the ability of the D.C. Circuit and the Supreme Court to actually do anything? RONALD PESTRITTO: Sure. And it's always astounding to me that now something like the ChevronDoctrine is the topic for popular political discussion. It's a sign of where things have gone in the country. But Chevronrefers to a case in Chevron, the NRDC, from the 1980s, where it was a question of whether an agency essentially had acted within the bounds of a law that Congress made. And when Congress makes law, as you know, usually, they're vague. They're ambiguous. And agencies have to figure out what these vague things mean and then put them into policy. And so what the Chevrondoctrine did is it said, basically, look: When an agency makes policy that comes from an interpretation of a law, if that agency decision is challenged, the reviewing court is to give great deference to the agency's interpretation of the law, instead of starting fresh with its own legal interpretation. And what that means is, any time someone wants to hold an agency accountable and try to keep it within the boundaries of the law, as you've said, they kind of start off behind when they go into court, because the court is deferring to the agency. And that's why, as the agencies have become more and more robust, especially under the Obama administration, all of a sudden, people have discovered we don't have a very good legal environment to handle these kinds of situations. And it's why you started to see more and more skepticism among some of the justices about so-called Chevrondeference. And as you know, there's a related kind of deference with regard to agencies when they make their own regulations that also creates a lot of trouble there. HUGH HEWITT: And what I want to communicate to people is, when we say the agency, we're not talking about some conference room in Washington where people with oversized brains sit around and monitor the world with an amazing amount of precision. It's not the control room at the Pentagon. We're actually talking about, for example, in the case of the EPA, they have nine regions. And in those nine regions, they have various offices. And in those various offices, they have GS1s through 4s. And those GS1s through 4s are stamping papers that they frequently misplace, they do not act upon. And they don't return your phone call. And there's simply no way to get accountability. So you call your Congressman, who then calls the agency, who can't find the file. And they say, start over. And when you go to court to try and get someone to do their job, they're told, you can't make them. It's not ripe. And when it does become ripe, you've got to defer to them. It is actually-- I don't even think I can communicate to people the frustration that goes with 30 years of dealing with this, Dean. And I've done it for 30 years. RONALD PESTRITTO: Can I add another scarier part to that? RONALD PESTRITTO: If you follow the logic of this, where do agencies get their authority? How can an agency say-- like the Environmental Protection Agency-- if a question comes up, do we have the power to actually do something? Well, that comes from an interpretation of the law that creates the agency. So the Clean Air Act-- so the agency goes back to the Clean Air Act and says, in our read of this law, how much power do we have? Well, when you bring the ChevronDoctrine into that question, think about what it means. It means the court defers to the agency's understanding of the law. RONALD PESTRITTO: The court defers to the agency's own understanding of the extent of its own powers, that the agencies are deferred to, when the question is, how much power do they have over you and me? And it is a scary, scary doctrine. HUGH HEWITT: Now the good news is, something began to develop in the last 10 years, called the Major Rule Doctrine. Now, why don't you expand on that to people, because it's the first breath of fresh air, the first rustling of the leaves of freedom inside the agencies. RONALD PESTRITTO: It is. And I think it's appropriate to bring that up in the context of talking about Judge Kavanaugh, because he was one of the primary proponents of this way of limiting Chevron. He has been, in some of the opinions that he's written on the D.C. Circuit. And the idea is, you take this whole Chevronsituation which we've been talking about, and you get a really big policy question. Did Congress intend to give the Food and Drug Administration the power to regulate tobacco? Or did Congress intend to give to the IRS the power to make a very controversial policy coming out of Obamacare, as was the case in the King v. Burwellcase from a couple of years ago? And what the courts have said, on occasion now, is when we get to that kind of a big question, they said, wait a minute. There's no way Congress could have intended for an agency to take an ambiguous law and make this big of a policy decision. There's no way they could have intended for the agency to do this. And so they've created what is now referred to as a kind of major questions exception to the otherwise ordinary situation where courts are going to defer to agencies. And so for example, in the big Obamacare case, when Justice Roberts upheld the IRS understanding of Obamacare, he refused to invoke Chevron. He took a fresh look at the law himself. In my view, he got the law wrong, but at least he didn't defer to the agency. And he basically said, look: There's no way Congress meant for the IRS to make this decision. And so I'm going to take a fresh look at the law myself. And so you're right that that's a bright light. And it's an example of where the Supreme Court really has adopted some of Judge Kavanagh's reasoning. HUGH HEWITT: When we come back from break, we're going to talk about how Brett Kavanaugh, if he is confirmed as we expect him, will move the court, along with Justice Gorsuch and the three other center right judges, including the Chief Justice Alito and Justice Thomas, to a new doctrine of responsibility for the administrative state when we come back. Welcome back, America. 51 minutes after the hour from the relieffactor.com studio on the West Coast. Headed to Oregon today, but the Hillsdale Dialogue today has been fascinating with Dean R.J. Pestritto of Hillsdale where he runs the graduate school. We're talking about administrative law and Brett Kavanaugh. The very first case, if he's confirmed by October, that he will hear, Dean, will have to do with the U.S. Fish and Wildlife Service designation of critical habitat. Now, I've been doing this for 30 years. This is dart throwing at its best. It's not that they're bad people, it's just that they're making up stuff, left and right. They're just pulling stuff out of their back pocket and saying, we think the Stephens' kangaroo rat was here, and the gnat catcher was there, and the tiger salamander was there. And they just designate critical habitat, and it destroys the value of land. And what will it matter if Brett Kavanaugh goes on to the court and starts looking at things like critical habitat? How does the law change, do you think? RONALD PESTRITTO: Well, I think, like anything in the Roberts court era, first of all, changes are going to be incremental. And that, I think, is true of areas outside of administrative law, as it is in areas of administrative law. But Judge Kavanaugh would join a kind of growing momentum on the Supreme Court. There's just been a lot of questions from a lot of the other judges lately, and not only the so-called conservative judges, about some of the doctrines that we've been talking about. And not only in the area that we've spent some time talking about this morning, the Chevronarea and courts deferring to how agencies interpret laws, but also even more fundamentally in looking at the structure of agencies and asking the question, how accountable are these agencies? Is this a setup that actually works in a Constitution that's supposed to ultimately be accountable to the people where you have these people making very significant decisions that affect life and property? And they're not under the control, or they're under very indirect control, of somebody who's actually voted on by the citizens. And Judge Kavanaugh has been very active on that question. And in particular, with the agency that came out of the Dodd-Frank law, the Consumer Financial Protection Bureau, the CFPB-- has been a major question-- the brainchild of Elizabeth Warren, of course-- there's been a major question about, is this agency actually constitutional? You have the single head. And the single head is not removable by the president, except for extreme cause. And so the question is, how accountable is an agency like this to the voters, if the President can't control it? HUGH HEWITT: And Judge Willett and others, Judge Ho down in the Fifth Circuit, have raised the same question about the Federal Housing Agency and whether or not it's constitutionally comprised. Here's where I think I might be a little bit more optimistic than you. Because the Supreme Court operates on the rule of four-- it takes four judges to bring up a case to vote cert-- I believe Chief Justice Roberts has deferred to Justice Kennedy for many years about what they would bring forward and set the agenda. They're down to 60 to 70 cases a year. Now that he's got five votes, I think you might see the Roberts court go into third gear here. Do you think I'm just crazy? RONALD PESTRITTO: No, I don't think you're crazy, I think you're more optimistic than I am. John Roberts worries me. I think I've got some good evidence to back that concern up. And you know, I just think the approach-- for instance, as there always is with a Supreme Court nomination, there's a lot of focus on abortion and major issues like that. And you know, the history of the Roberts court has been incremental-- death by 1,000 cuts. I think they've been doing that with the administrative state. You could be right. It could be because they've got to get the five votes. You could be right about that. HUGH HEWITT: And Justice Kennedy was so bad on this stuff. The Rapanosdecision, which I'm sure you teach-- the classic example of making a bad situation worse by adding even more ambiguity to an agency's approach, right? Now, that might change. RONALD PESTRITTO: It might change. And I think where Justice Kennedy did a lot of damage-- although he also expressed skepticism, although I suppose it would depend on what side of the bed he woke up on in the morning. Where he did lot of damage was, when you got into an area where it was sort of a hot button issue, he would tend to go for the politically correct decision, as opposed to following the law that sometimes he himself had followed in the past. And a great example of that-- Massachusetts v. EPAcase from back in the Bush administration, which makes no sense in administrative law. This is where the courts sort of opened the floodgates for the EPA to regulate greenhouse gases, even though the Clean Air Act was enacted to deal with acid rain. But it was a kind of politically correct hissy fit, basically. And Justice Kennedy was in the 5-4 majority there. And that, I think-- those days are hopefully going to be over. HUGH HEWITT: Well, we will see if they're over, if they're curtailed, or if we're just on a trajectory that is different. It sometimes takes 70 years to undo this, right? You teach Progressivism. This got under way in the 1910s. It's 120 years later. If we just change the trajectory towards accountability, then I'm an optimist. Do you share that view that, if we just can get a reorientation, we'll be in a better way? RONALD PESTRITTO: I do. And you're absolutely right to emphasize that it's a long game. It took the Progressives a good 100 years to have the effect that they have had on our government. And so we're not going to overturn that in an election cycle or two. If we get on the right trajectory, I think I would share your optimism. HUGH HEWITT: Always, Dean Pestritto, great to have a Hillsdale College person with us. Great to have you here. And Brett Kavanaugh, we cannot wait for you to get where we need you to be on the Supreme Court.